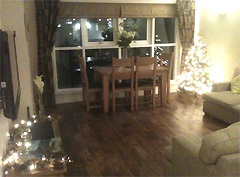 A lovely Christmas in this fantastic apartment – warm and cosy despite the sub-zero temperatures outside. The well-equipped kitchen was particularly appreciated – many thanks. ‘Tis the season to be booking! It’s at this time of year that holiday home owners start getting very busy. With Christmas out of the way, but family still together, plans are afoot for many a family holiday in 2011. If you are considering staying with us this year, please don’t leave it too late. January will be a very busy month for bookings and we anticipate that the peak weeks will all be pretty much booked up by the end of the month. If you have a preferred week that you’d like to book, please get in touch and we can advise on availability which will be changing on a pretty much daily basis over the coming month. We would just like to take this opportunity to wish all our visitors a very Merry Christmas. We hope you have a fun day and that Santa has been good to you all! There was a small tremor (or earthquake if you care to dramatise it a little!) in Kendal this evening. It happened around 15 minutes ago, close to 11pm. It’s the third such event I recall experiencing. The first was in Cheshire when I was quite young, but the second was only last year, which I also felt in Kendal. 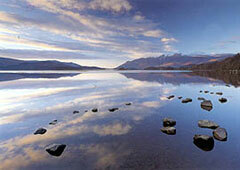 This event at the end of April last year turned out to affect much of the South Lakes. This more recent one felt much stronger (to me, at least), and more prolonged than any I’d previously experienced. 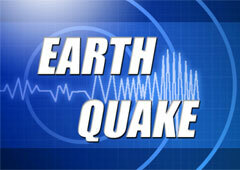 Did you feel the tremor? If so, please let us know by posting a comment, telling us what you experienced and where. Climbing enthusiasts will be interested to hear that the climbing wall and facilities off Shap Road in Kendal are about to get bigger and better. Kendal Climbing Centre has just completed the first phase of its expansion plans, meaning that it is now home to two new bouldering rooms, a gym, a meeting room and a large conference room. Phase 2, due to be completed by May 2011, will see the addition of more bouldering space and the construction of an aerial adventure experience for non-climbers. The centre’s competition wall is also being refurbished so that it will be able to host national competitions. 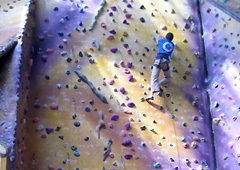 Kendal Climbing Centre welcomes both locals and visitors alike. Admission for non-members is £8 for adults, or £7 for under 18s. Courses are also available for younger children or for anyone without experience. See the video below for some footage from the centre. This is a short film that was put together as part of the 2008 Adventure Film Academy at the Kendal. Mountain Film Festival. Wonderful apartment and location. Will highly recommend and hope to return in 2011. Artisan at Booths is a good place to eat. Followers of BBC2′s recent comedy ‘The Trip’ starring Steve Coogan and Roy Brydon may be interested to see a map of the locations of the restaurants featured in the series. 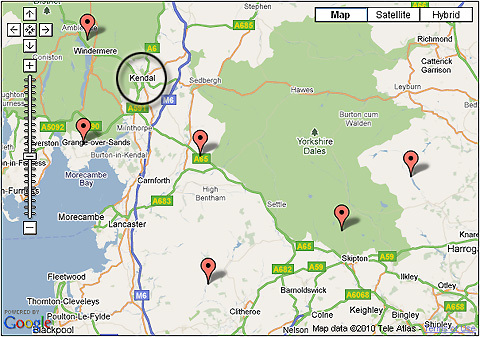 They are shown on the map below which you can click on for a more interactive version, and they highlight what a great base Kendal is for any foodies wishing to visit some of the locations themselves. Unbeknown to many, Cumbria has more Michelin stars than any region in England outside of London. What an amazing apartment! Xmas tree was the cherry on the cake. The New Moon and Rococo Joe’s – recommended. Definitely be back! The prestigious Lake Artists Society make a welcome return to Rheged for their fourth winter exhibition. The exhibition is open daily from 11am to 4pm until 14th January 2011. With over 150 works from the county’s best artists, entry to the exhibition, held at Rheged, is just £1.